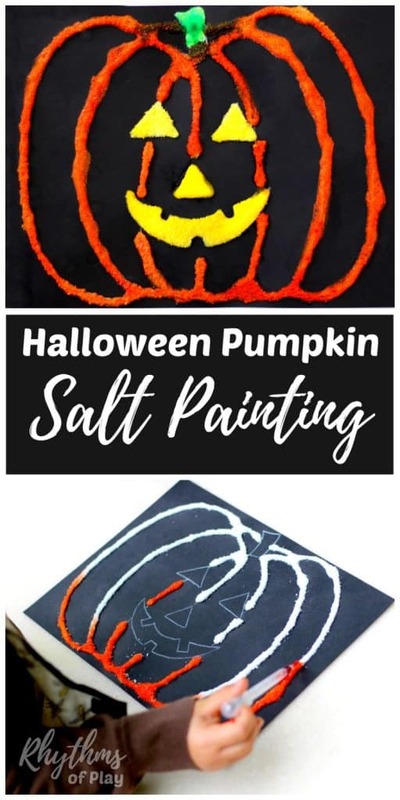 Making a Halloween pumpkin salt painting is an easy art project for kids that takes minutes to set up. 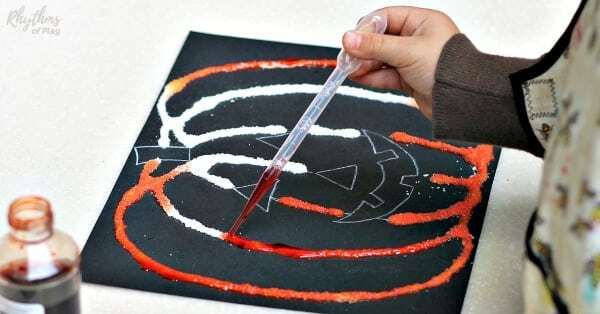 Toddlers preschoolers, kindergarteners, and kids of all ages will enjoy the salt painting technique used to create this raised watercolor decoration. Younger children will need assistance creating their Jack o’ Lantern pumpkin art, while older children will be able to complete this Halloween pumpkin art project from start to finish on their own. For more fun ideas, be sure you pop over to check out this awesome collection of Halloween Art Projects Kids LOVE! Get into the spirit of Halloween with this Halloween pumpkin art project for kids! Salt painting is a watercolor painting technique that kids LOVE! You can complete this Halloween pumpkin art project for kids using liquid watercolors and pipettes or paint brushes, or you can use a solid watercolor pallet with a cup of water and a paintbrush. Both options are great for fine motor practice and hand-eye coordination. See the directions below for more information. My daughter made her Halloween pumpkin art on our DIY outdoor art table and mud kitchen. Click on the link to learn how to make your own! As mentioned above, there are a few different ways to create this Halloween art project. Please read through these directions before starting your pumpkin craft. For more tips and pictures about this process be sure you check out our harvest pumpkin watercolor art. 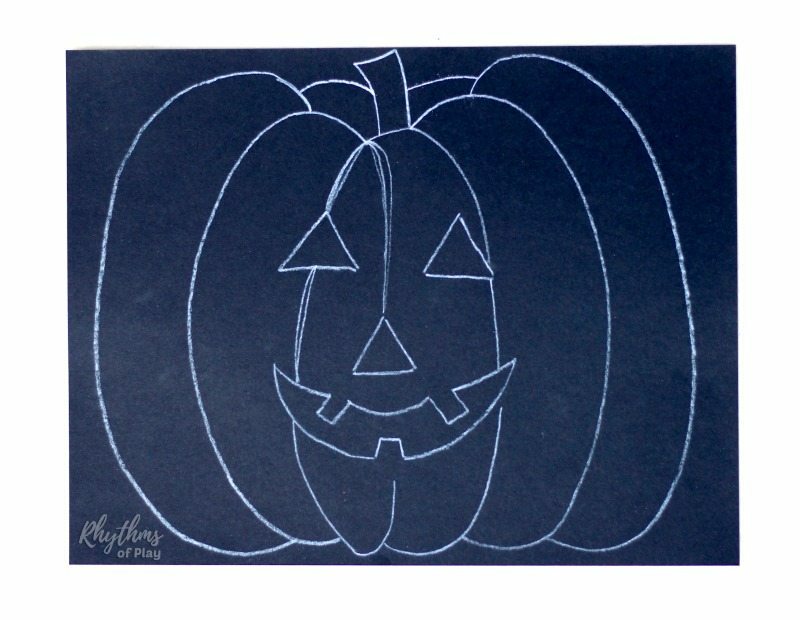 Step 1 – Draw a Halloween pumpkin on black cardstock using a white colored pencil. You can do this for your child like I did or have them give it a go on their own. Don’t worry I thought I couldn’t do it either, and mine turned out okay. It doesn’t need to be perfect. You will be covering the lines with white glue next. Step 2 – Trace the outline of the Halloween pumpkin drawing with white glue and cover with salt. Younger children may need help with this step. Please Note: The colors will bleed into each other if the glue and salt lines touch. Keep them separate if you do not want the colors to run. Work with orange first so the orange does not bleed into the yellow. It does not matter much if the yellow bleeds into the orange. It will still appear orange. Step 3 – Shake off the excess salt on the Halloween pumpkin art and use a pipette or paintbrush to apply watercolor paint to the salt that is now stuck to the lines of glue. Do not wait for the glue to dry. Add watercolor to the salt using a pipette like my daughter below, or a paintbrush. Liquid watercolors can be applied with either a pipette or a paintbrush. If you are using a watercolor pallet you will need to apply the paint with a paint brush. Don’t forget that you will need a cup of water if you choose this option. Step 4 – Cover the jack o’ lantern face with white glue and cover with salt. Either trace the outline of the Halloween pumpkin face or fill in the whole area with white glue like we did. Sprinkle salt on top to cover the white glue. Step 5 – Shake off the excess salt and paint the Halloween pumpkin face. Step 6 – Trace the stem of the Halloween pumpkin with white glue and cover with salt. Make sure the glue lines do not touch or the color will bleed when you paint it. Step 7 – shake off the excess salt and then paint the stem of the Halloween pumpkin. Apply green paint carefully if you do not want it to run into the orange lines of the pumpkin. 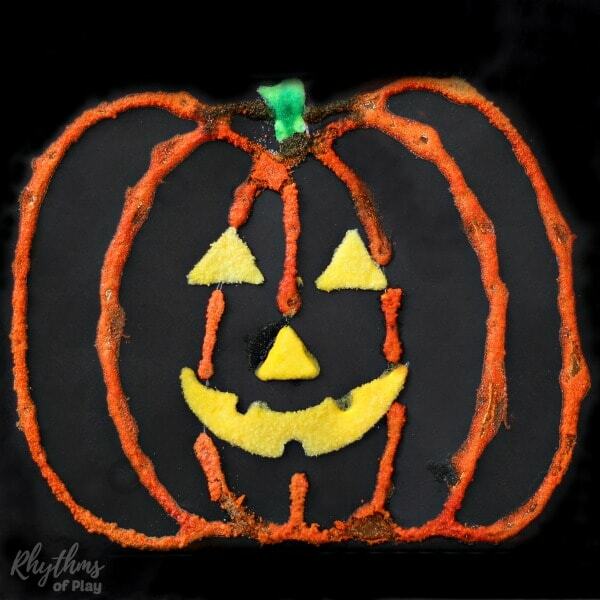 You can see how the orange and green combined a bit in our Halloween pumpkin salt painting in the photo below. The top of our pumpkin looks a little black. Also notice, how the orange and yellow stayed separate because the lines did not touch, and we used orange first. 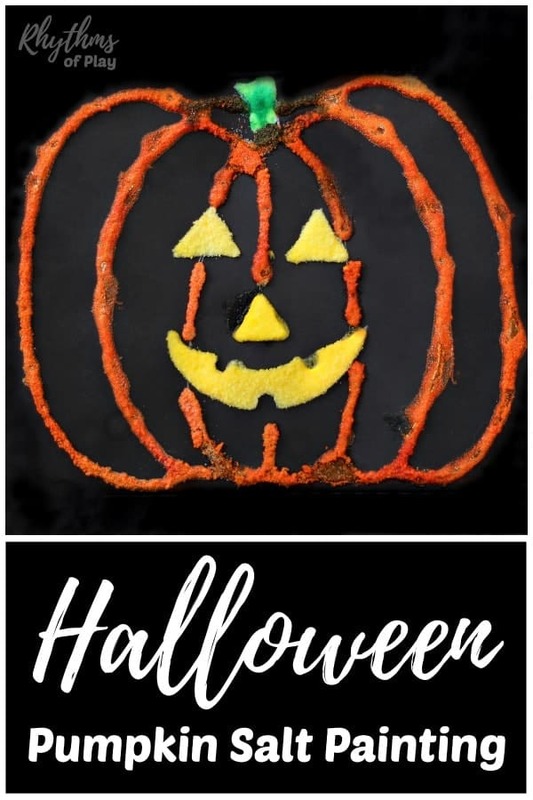 Another way to create this pumpkin art is to outline the entire pumpkin with glue and sprinkle with salt in one go instead of working in the stages described above. Creating a salt paint Halloween pumpkin is an easy art project for kids that only takes minutes to set up. Kids of all ages will enjoy the craft technique used to create this raised watercolor decoration. Try it today! For more Halloween fun check out our Glowing Pumpkin and Glowing Ghost Calm Down Sensory Bottles. They make great calm down lanterns and decorations for Halloween night and are perfect for kids that get a little anxious about Halloween and all of its friendly frights. You may also like this awesome collection of Halloween Art Projects Kids LOVE! It’s filled with lots of fun art projects to try with the kids. Don’t forget to check out our Fall bucket list for the best Autumn EVER! I do not understand what you mean about not letting the glue and salt touch. Is there one line or two? Also does the paint go on the glue or just the salt? I’m sorry I did not make it clear Sharon. The glue and salt have to touch, just make sure the orange lines of the pumpkin do not touch the lines that will be green or yellow if you do not want the colors to run. You will paint the salt AND the glue. You will need to pour salt on the glue, shake off the excess, and then paint the salt that is now stuck to the glue. I hope that makes sense. Yes that makes sense. Thanks for responding back. It looks like a cute project for my grandson! !